This really compelling series first piqued my interest when I read Our Next Life’s blog post about it. The magic continued with Think Save Retire. Afterward, Northern Expenditure and My Countdown to Freedom all chimed in. All of their answers are incredibly inspiring, carefully planned, and simply great reads. Here’s the thing: I’m not on the road to FIRE, because I don’t want to be. Let me clarify. Mr. P and I don’t currently have any desire to retire early. But working towards financial independence? Game on. The biggest hurdle between us and financial independence is our mortgage. We bought our house while we were engaged with the intention that we would both work on it as much as we could and call in reinforcements when the going got tough we realized the idiots that owned the house before us did things like run cable through the brick in the top of the fireplace thereby turning the family room into a pool when it rained. Fixer upper, indeed. DIY disasters notwithstanding, we were able to scoop up our house at a low point in the market for a low 30-year fixed-rate mortgage. But let’s be serious. Who wants to make mortgage payments for thirty years? Originally, we had always intended to pay a few hundred dollars extra per month. Now, I’ve earmarked all my side hustle money for mortgage repayment, and we’re trying to scale back our budget enough to at least double our payments every month. That’s a really long-winded way to say at this pace, our house will be paid off in 10 years. There are a lot of variables that are up in the air right now. Kids, for instance. More advanced degrees, for another, since continuing education is the only way to increase our salaries as teachers. So, we could certainly be more aggressive with our payments, but I figure this is the right amount of intensity for us to stay motivated without feeling burned out or overly anxious. I’ve read lots of posts and had lots of conversations with family and friends about leaving the workforce. People don’t like their jobs, hate the monotony, or feel that their time would be better spent elsewhere. To which I say, go for it. I’ll cheer you on really loudly from the sidelines. But I’m not coming with, and neither is Mr. P.
We love how we spend our days. Is there too much red tape in teaching? Yes. Is the entire profession in the midst of a massive overhaul that is being championed by politicians who have never set foot in a classroom? Yup. Are there days when I wipe tears, break up fights, and send kids to the nurse for chewing on pens that proceed to explode in their mouths? You bet. * Would I do my job for free? In a heartbeat. Teaching is my passion. I love everything about working with kids, and I’m in no rush to leave. Currently, I’m on track to retire with a full pension at the age of 57 with the possibility of finishing up a few years before that. That’s more than 25 years away. That’s fine by me. Because, for the most part, I’m already spending just about every day doing exactly what I want to do. As for what happens when 57 rolls around, who knows? Maybe we’ll travel the world. Maybe we’ll babysit grandkids. Maybe we’ll open a library in a country where kids desperately need access to books. Maybe we’ll do all that and more. Only time will tell. *True story. Happens every year. In middle school. So Tell Me…Do you have plans to retire early? Do you love your job? Hate it? What does your next life look like? Thanks for this great contribution to the series! It’s so inspiring that you’ve both found your passion and are happy teaching, despite all the challenges that come with it these days. If we had that, I’m sure we’d be happy working longer, too… but we don’t. We’re also in the camp that thinks it’s only a semantic difference between early retirement and financial independence. The key is having the resources and flexibility to not *need* your job, and you guys are definitely on that path. Plus, having summers off seems like it would make a huge difference — if we could have two months off a year, we’d probably be able to keep going a lot longer! But we haven’t even been able to take a full week off this year, which makes burnout inevitable. Your future vision of traveling the world or building libraries sounds pretty wonderful! Thank you! That’s so kind of you to say. I’m fortunate to have figured out a way to do what I love right out of college. Sounds like you and your finance have the perfect game plan right now. Being in your 20s and having a such a stable foundation is really liberating, isn’t it? Sometimes I get nervous thinking about the big 3-0, but I realize I’ve already accomplished a lot. Hi Penny! Thanks for continuing the series, and I love the fact that even though you aren’t looking to retire early, you still have a goal of financial independence. While my wife and I do have a goal to retire ASAP, I understand that early retirement isn’t for everybody. But becoming independently wealthy? That’s a goal that I would HOPE we all share. I love this post because I can feel the passion that you have for teaching just by reading your words. And in the end, being happy with the choices that you make is what life is all about. Keep doing what makes you happy! Amen to everyone striving to become independently wealthy! I’m so happy to have found your blog and your Twitter account. I look forward to learning more about your plans. Thanks for getting the ball rolling with this series! I really respect that you like your jobs enough to stay in them. I wish I had that but I actually work several part time jobs. I want to get away from them ASAP! I think the security and flexibility financial independence gives you is a great reason to aim for that, regardless of if you want to leave your job. You hit the nail on the head with security. I was RIFed twice when I first started teaching, and those years were two of the hardest and most unnerving experiences for me. I feel like we’re both on solid footing now, but education is so political right now – I’m never taking a day for granted! How lovely for you to have a job that you enjoy! Although the Mr and I plan to retire early, if we actually find jobs that we love we’ll be more than happy to keep working once we pass our Financial Independence date. As of right now we don’t “hate” our jobs, but they certainly aren’t jobs we love doing or give us any sense of fulfillment. So the search continues for something we love and, in the case that we don’t find it, we have early retirement to look forward to in the meantime. Glad you both found jobs that coincide with your passions and thanks for sharing your story! I feel so fortunate to have found a career that brings me such joy. It’s so smart to keep searching to find something you love! That’s so much better than chasing money, IMO. 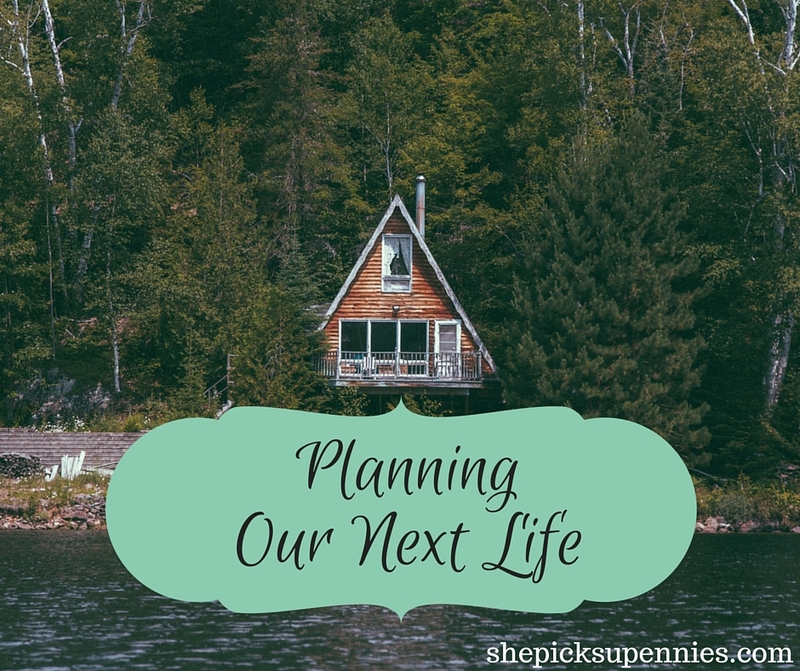 I love this addition to the Our Next Life series! And as a mom of three, let me just say I’m grateful that people like you are out there in the schools teaching my children. THANK YOU! Part if our plan is paying off our mortgage early as well. And I’m finding that the hardest part is balancing paying off the mortgage and increasing investments. I really want to throw everything at the mortgage because those numbers will drop consistently if I do, but I need to find a good balance. That’s tough. Also, we should probably stop using the phrase “Early retirement” because for us, we will never stop doing things. We’re project people. But we’re also prudent. So we don’t want to risk everything. “Retiring early” for us means having the freedom to do whatever we want to do and not worry at all if it makes money or not! I mean it. Thank you. Teachers have been the reason my kids are in classes that fit them and why I know more about how they learn. They have been the ones that have changed their future career plans from “Sugar plum fairy” to “scientist.” Big fan of that change! We don’t have plans to retire early. Thanks to my being on disability for years and now my husband being on it, I’m not sure I’ll ever completely retire — voluntarily, anyway. And after being dependent on a government check each month, I’m honestly not sure if I want to go back to that. Like you, I want to pay off our mortgage early. But first I need to prioritize retirement savings, which have suffered. Next year will, if I have anything to say about it, be the year of the fully funded SEP. Once that’s done, we’ll start really ramping up the mortgage payments. The one good thing about living in Phoenix is that our mortgage is ridiculously low: $560. So the current extra $120 we pay is still almost an extra 20%. Once that’s dealt with, we’ll get a rental property. Passive income could definitely help make that whole retirement thing more feasible! Rental property makes my hands sweaty just thinking about it! I definitely don’t know if I have the temperament for that, but it’s an incredible passive income opportunity. I hope you’ll chronicle the journey on your blog. I love reading about all of your insights! I also have no courage about being a landlord… way too chicken for all of that! I’m not sure where the future will bring me as far as side hustles and retirement timelines, but I do know that I want to be rid of the mortgage early too! I’ve been “rounding up” my payments for awhile and make extra payments whenever I can! Everyone in my “real” life looks at me like I have three heads when I talk about paying my mortgage off early. It’s nice to hear there’s solidarity in the PF blogosphere! I think it’s great you’ve found the perfect career for you! Passion is so important to have, especially as a teacher. There’s nothing wrong with aiming for financial independence while not wanting to retire early- having that security is always a good thing. Plus, I imagine it’ll be nice to have that pension later on. My career has been a little all over the place, and I’m giving self-employment a try again. I have no idea what the future holds, I just want to be happy with the work I’m doing. Great post! I definitely know that I’ll have multiple careers throughout my life, I don’t know that I want to retire early either, I’ll just change what I do and I’m all about financial independence as something to work towards, but first I’ve got a ton of student loans to tackle. That’s so terrific that you love your job so much! I am a pretty big fan of financial independence, but I don’t really have a solid plan for it yet. I think it’s kind of difficult to plan for when you live a gypsy lifestyle… or maybe I am my own type of financially independent this way. We did retire early in our late 40’s and early 50’s. My husband received a buyout and retirement plan after working 33 years. We paid off the mortgage then. Let me tell you that if we had a mortgage there would be no way we could make it with just his check. I will not receive my meager retirement till I am in my early 60’s. We are never bored we garden, watch grandchildren, and travel when possible. It’s been a relieve to not have to go to work and do the things we love to do (I love to blog too) Have a great day! Hi Penny – my mum was and still is a teacher – I definitely think that sort of job is a life vocation and something you do because of the good days that totally override the bad! I hope I find a job where I have that level of passion! As for mortgages – the idea of paying something off for 30 years fills me with horror! Good on you for finding a manageable plan for reducing that timeframe! I would like to retire early – but in that sense I want to work for me rather than someone else!! I just stumbled upon this post and wanted to say YES! YES! I agree. I have been reading several other financial bloggers and kept thinking, it didn’t really apply to me. I am a Montessori teacher and I LOVE my job. Yes, I do look forward to my vacations, but only so I can recharge and dive back in to the classroom again. Early retirement isn’t the only reason for increasing personal wealth, just one of the reasons. I’m so glad you stopped by, Rose. I love connecting with fellow educators. I am right there with you on the needing to recharge. But I figure if we are already doing what we love, why stop? I hope you’ll chime in more often! 4 out of my 5 kids will be in public school next year, and I am SO thankful for the amazing teachers they have! I’m glad you have a job that you love. FI for us isn’t really about not working, but having the freedom to take work regardless of the pay. We paid cash for our house and that has been a HUGE help to our FI journey. Between no mortgage (and low property tax $1600yr), no student loans, no car payment, or any other debt, we have a lot of flexibility. I’m definitely more on the FIRE route, more to explore opportunities. I oscillate between being really happy and fulfilled to just wanting to stop for months at a time. We’re pursuing freedom – to not have to worry about money and not have to feel obligated to work. ? I’d love to have a job that I would be happy to do for free – haha, I guess in a way that is what I’m doing with my blog. That’s a great way to look at your blog! Chasing independence lets you keep all the possibilities open. Maybe that means retirement, but maybe that just means pauses like you said. I’m kind of on the path to FIRE. In some ways, I’m already there. I left my FT job last year to consult so that I’d have more time and freedom to chose the work I want to focus on. So far it has been an awesome experience and it would take me a LOT to go back to traditional employment, even though I’m making half the money I used to make. PS – I don’t have kids, but I feel very strongly that teaching is such important work. I’m really happy you enjoy it enough to not want to retire early. That’s the best kind of teacher to have! That is awesome that you have more freedom AND are pursuing things you love. Congrats, Caren!